A gift of a goat, made to Leben Moro and his group by the Dinka villagers of Thac, being loaded onto a boat. The goat was later cooked at a gathering in Malakal. Morton, Chris. "Gift of Thac villagers" Southern Sudan Project (in development). 03 Jan. 2006. Pitt Rivers Museum. 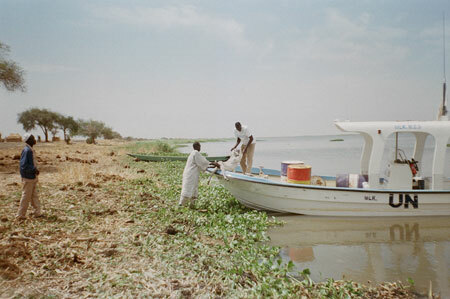 <http://southernsudan.prm.ox.ac.uk/details/2007.137.66/>.